Brian McGrory's life changed drastically after the death of his beloved dog, Harry: he fell in love with Pam, Harry's veterinarian. Though Brian’s only responsibility used to be his adored Harry, Pam came with accessories that could not have been more exotic to the city-loving bachelor: a home in suburbia, two young daughters, two dogs, two cats, two rabbits, and a portly, snow white, red-crowned-and-wattled step-rooster named Buddy. While Buddy loves the women of the house, he takes Brian's presence as an affront, doing everything he can to drive out his rival. Initially resistant to elements of his new life and to the loud, aggressive rooster (who stares menacingly, pecks threateningly, and is constantly poised to attack), Brian eventually sees that Buddy shares the kind of extraordinary relationship with Pam and her two girls that he wants for himself. 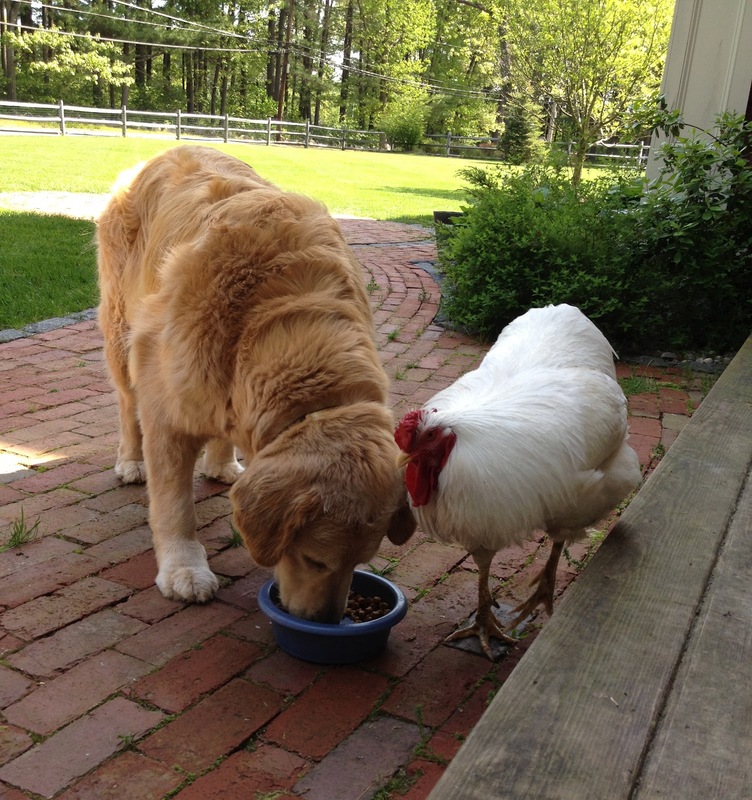 The rooster is what Brian needs to be – strong and content, devoted to what he has rather than what might be missing. As he learns how to live by living with animals, Buddy, Brian’s nemesis, becomes Buddy, Brian’s inspiration, in this inherently human story of love, acceptance, and change. I'll be honest and say that I was skeptical about this book. I'll be extra-honest and say that I decided to read it because my local library was closed for the day and I needed to READ. I'm not usually drawn to books about animals. But (even more honesty ahead!~~>) I was completely charmed by this short and sweet story. It is entertaining, amusing and honest. Brian McGrory's love for his wise and faithful Golden Retriever Harry is beautiful to read about. Their bond is incredible. I read the passage of Harry's death with very watery eyes. Despite the tears in the beginning, most of this book is heartwarming and funny. Brian, a single city guy, ends up living in suburbia with a new wife, 2 step-daughters, 2 dogs, 2 rabbits, 2 cats and a rooster. A rooster that is loud and messy and seems to very much enjoy tormenting McGrory. The relationship between man and bird is laugh out loud funny at times. I have to say that I'm not big on the pet stories either. I think it's because we didn't get a pet until I was 9 or 10, so I don't have that early connection. However, I can understand how this author's unique situation could lead to a lot of laughs! I'm glad you unexpectedly enjoyed this one. I like animals (I'm a cat person) and I've always had pets. Pet stories don't usually sway me though. Hmm, no idea why. But yep, this one was very good. I haven't read an animal story since I finished Marley, but the idea of reading about a pet rooster does make me giggle. It was pretty darn funny ;) A rooster running around and attacking this poor guy all the time, ha ha! I stay away from book trailers usually. I like to make the scenes up in my mind :) But for a memoir/nonfiction read I thought I'd go for it. I just finished this book and enjoyed it. Thanks for visiting and commenting Teena :) I just visited your blog as well. I'm glad you liked this one too!